So I just got called a ‘culinary artist’ by an old friend in the comments of the instagram picture of this recipe. Guys, let me tell you something: I am not a culinary artist! I was super flattered to receive the comment, but I wanted to tell you all that I am by no means an expert. I like to think of myself as a mad scientist when it comes to cooking. I make a mess and I sometimes look crazy doing it. I sometimes use measurements, but usually I don’t because I like to use my own gauge for things. Sometimes things turn out well (and I blog about them), but sometimes they don’t and I try again. I love to cook, but I’m still learning. So use these recipes with that in mind! 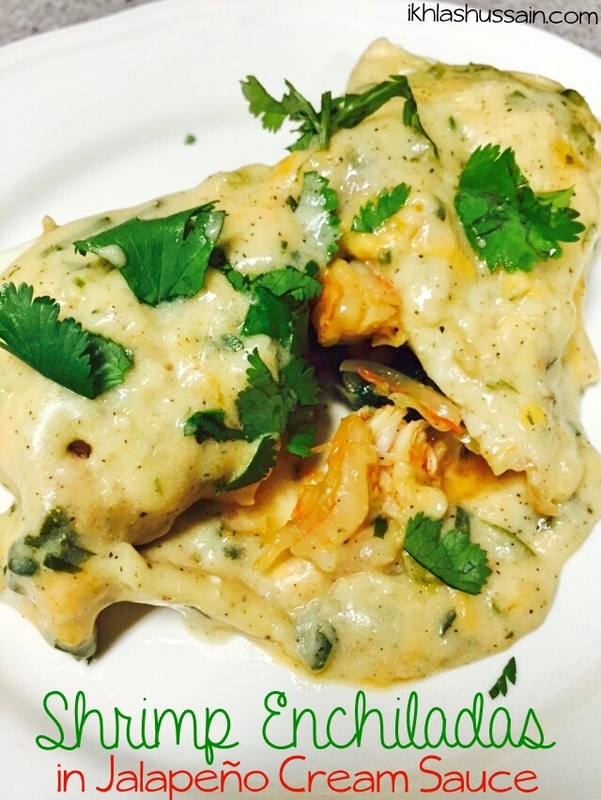 With that being said, let’s talk about these Shrimp Enchiladas in Jalapeño Cream Sauce. Can we just talk about the sauce first? The sauce is to die for, guys! I am currently obsessed with fresh herbs. I never really used cilantro or basil in my cooking before, but now I just can’t get enough of the fresh taste they bring to dishes. There’s fresh cilantro in the cream sauce, along with jalapeños, which just matches so perfectly with the crunchy, shrimp filling inside. Baked until the sauce is hot and bubbling, these enchiladas are best eaten on a cold, Winter day when you’re craving something warm and comforting. And what can be better than a dish served straight out of the oven? The best part is that you can prepare the enchiladas in advance and refrigerate. Then all you have to do is pour the sauce on top, bake for half an hour, and voila! A comforting and yummy meal is at your table. So what are you waiting for? Set oven to broil on high. Lay shrimp out on a flat, parchment-lined baking sheet. Drizzle with 1 tbsp olive and sprinkle with salt and pepper to taste. Broil each side for 2-3 minutes, or until golden. Do not overcook. Remove from heat, let cool, and chop into bite sized pieces. Set aside. Preheat oven to 375 degres F and grease a 9x13 inch baking pan. In a medium pot, heat olive oil. Add chopped garlic and green onion. Add cabbage, carrot, and spinach. Cook until spinach starts to wilt slightly. Do not overcook or filling will be soggy. Add oregano, and more salt and pepper to taste if necessary. Set aside. In another medium pot, melt butter. Add flour and whisk until mixture is golden brown. Slowly add chicken broth and continue to whisk until mixture is consistent. Add sour cream, jalapeños, and garlic powder. Stir in half a cup of cheese, and cook sauce until bubbly and cheese is melted. Remove from heat and add chopped cilantro. Scoop filling into the centre of tortilla, add a handful of grated cheese and fold it tightly. 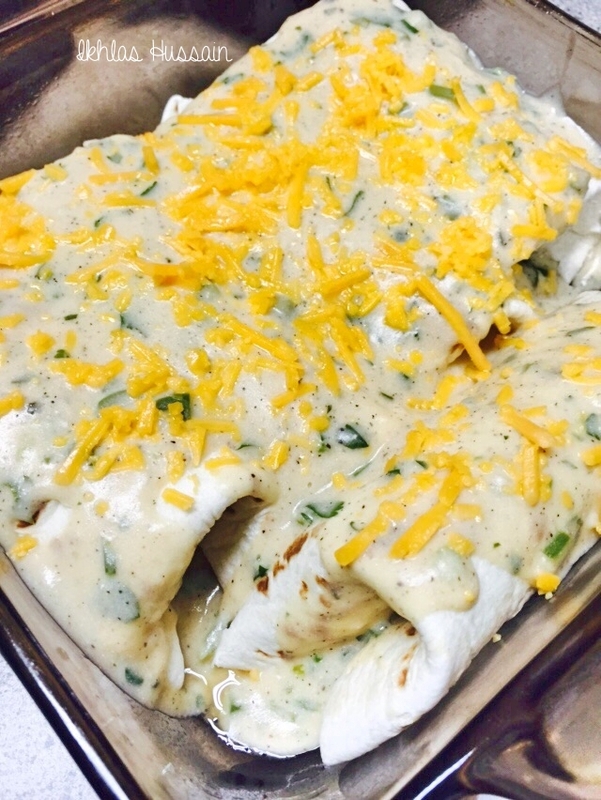 Place rolled tortillas into prepared baking sheet and pour jalapeño cream sauce on top. Top with additional shredded cheese if desired. Bake 20 to 25 minutes, or until sauce is bubbling on sides. Garnish with remaining cilantro, if desired. *Original recipe uses raw shrimp. If raw shrimp is used, increase broiling time until shrimp is light pink in colour. **Chicken can also be replaced for the shrimp. Use 1 1/2 lbs chopped cooked boneless chicken legs and thighs, or breast to the filling. Recipe adapted from Damn Delicious. 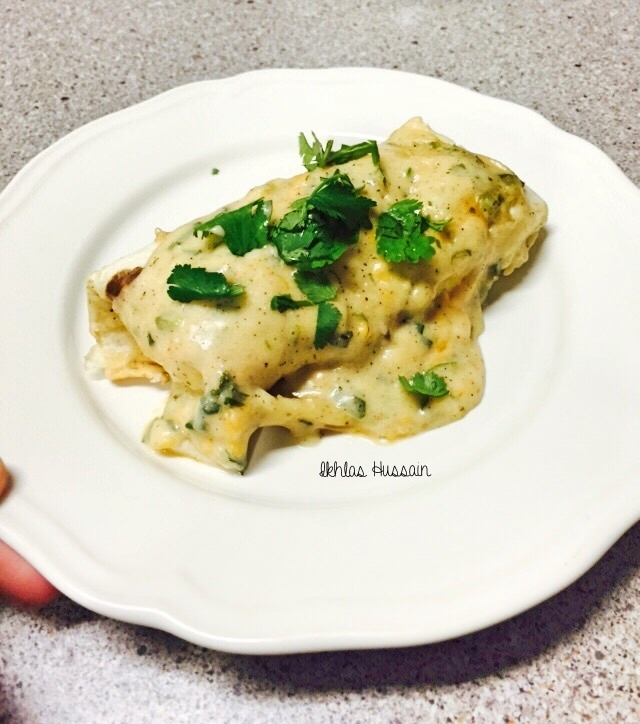 I’ve made enchiladas before, but my original recipe has a cream sauce both inside and outside the tortilla. What I love about this recipe is the fact that there’s fresh veggies inside and then a spicy cream sauce outside. It’s definitely lighter than having both the sauce smothered chicken inside and then outside. To make it a lighter option, you can forgo the cream sauce completely and just eat your tortillas with just the filling. It’s still good! The original recipe calls for raw shrimp. You can definitely use those, but I had cooked shrimp on hand, and so used those instead. Just be mindful of the cooking time. Cooked shrimp just needs to be lightly browned, because it’s already cooked, so be careful not to overcook it or else you’ll have chewy shrimp! If you’re not a fan of shrimp, you can easily add cooked chicken to the filling instead. You can still broil the chicken to get that roasted taste and then chop it up the same way. I love the inclusion of fresh veggies in this recipe; it makes the filling so much more flavourful than if it was just with shrimp. Be careful you don’t overcook the veggies though or else you’ll have a soggy filling! And the fresh cilantro in the sauce adds such a wonderful, fresh taste. I’m definitely going to be using it a lot more in the future! You can also easily double the recipe, so that you can keep the filling and sauce and make the enchiladas fresh when the mood strikes. Or prepare them in advance and then bake when you need them! 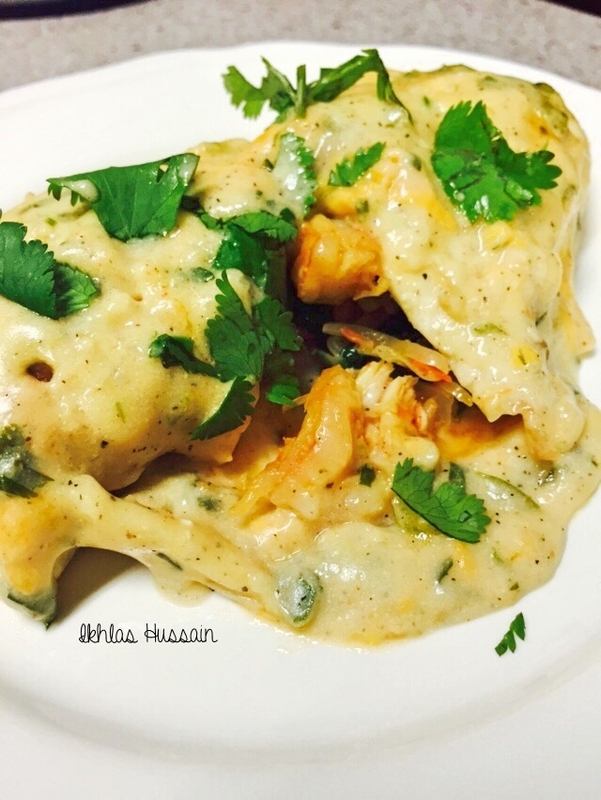 Easy, flavourful, and fresh; these Shrimp Enchiladas with Jalapeño Cream Sauce are sure to spice up your usual dinner routine. So try them out and let me know how you get on! You had us sold at the jalapeño cream sauce. We can’t wait to try this recipe! Wow, I never thought to add shrimp to enchiladas. This sounds delicious! I’m definitely making this.